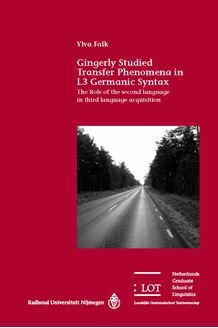 The objective of this thesis is to shed light on the role of the background lan­guages (L1 and L2) in L3 acquisition of syntax. Three empirical studies on L3 acquisition of a Germanic language all point to a decisive role of the L2 syntax in L3 acquisition, both at the initial stage and at higher levels of proficiency. A L2 Status Hypothesis (L2SH) is developed in order to explain this behaviour. The L2SH predicts that transfer in L3 acquisition will come from the L2 and that this transfer can be both facilitating and hampering. The reason for the strong impact of the L2SH is motivated by the many cognitive similarities that an L2 and an L3 share, in terms of age of onset, outcome, learning situation, degree of metalinguistic knowledge, learning strategies and awareness of the language learning process, conditions that are different in the L1. These simi­larities for the L2 and the L3 are further discussed by taking a neurolinguistic suggestion into account, according to which the L1 grammar is sustained by procedural memory whereas both L2 and L3 grammars are sustained by de­clarative memory. The L2SH is further compared to other current hypothesis concerning the acquisition of L3 syntax.